The MapTime server is back online after a small glitch with the server hosting our server. A new "Evolving Earth" TimeLine will appear soon on the site, which is designed to accompany The evolving earth Year 3 module run by Ocean and Earth Science at the University of Southampton. The TimeLine is not quite ready and will no doubt have a few tweaks but if you want to have a preview of the TimePoints in their current form, you can visit the TimePoints page and search for the keyword: evolving_earth or you can make the TimeLine here. The good news is that when the website is backup, it should have some new features including a second TimeLine. More on this soon. In the meantime, please get in touch if you have any questions or would like more information. The main website is still down, unfortunately. Whilst it is getting fixed, a backup website is available here. It should work as previously described for the main site, although there have been a few tweaks since then. It appears that the website has gone down again. (Probably another evil robot attack on one of the other servers hosted by the machine.) Apologies for any inconvenience. We will hopefully get it back up soon. Watch this space for updates. As previously indicated, we are currently basing much of the default TimeLine on the New Scientist Evolution and Becoming Human timelines, which place this particular event at 195,000 years ago. It seemed like a gap in the current TimeLine and a useful TimePoint to have. More information regarding our default TimeLine will follow shortly. E-mail forwarding seems to be happy again. 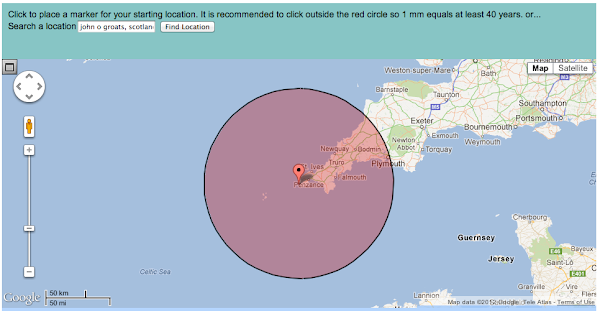 Comments and suggestions can once again be directed to webmaster[at]maptime.co.uk. It appears that the service provider that should be forwarding on our @maptime.co.uk email addresses is not currently forwarding them on. We are investigating the matter and will hopefully get it sorted out soon (or change the contact email addresses). In the meantime, if you have any comments, suggestions or queries please contact Richard Edwards: r.edwards[at]soton.ac.uk or Joel Parker: joel.parker[at]plattsburgh.edu. A Glossary of key terms is now available. This will be expanded in time to include the key TimePoints, TimeLines and Keywords from the website. If any confusing terms are missing, or any of the terms listed still do not make sense, please let us know. Deep Time. Deep Time refers to the vastness of the geologic timescale. The formation of Earth occurred some 4.54 billion years ago. 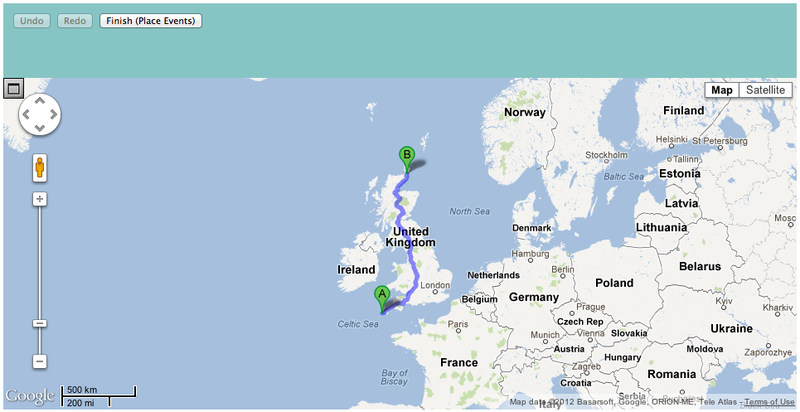 This is a timescale that is hard for the human mind to visualise - hence the MapTime approach of using Google Maps! Google Earth. 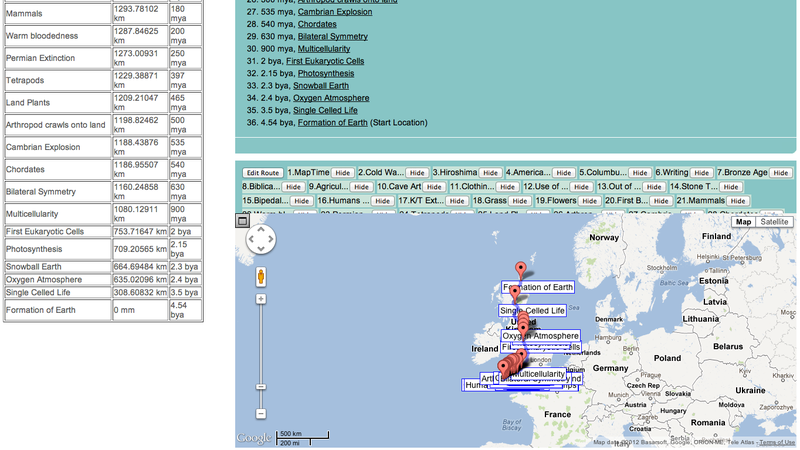 The original MapTime paper made use of Google Earth in place of Google Maps. Google Earth has a few more options for controlling the TimeRoute and we are currently looking into ways to export TimeRoutes from MapTime to open up in Google Earth. Google Maps. Google Maps is a free, widely known service which lends itself perfectly to the MapTime concept and is free for non-profit use within the scope of the project. MapTime. The MapTime project for visualising Deep Time using Google Maps, available at www.maptime.co.uk. MapTime Blog. 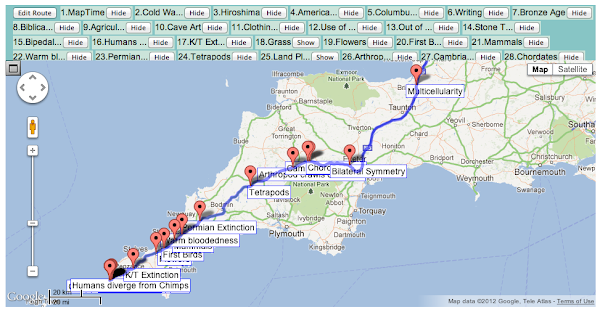 A blog of all things MapTime available at blogspot. MapTime Paper. 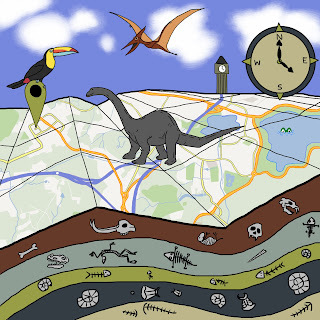 The original paper: Parker, J. D. (2011) Using Google Earth to Teach the Magnitude of Deep Time. Journal of College Science Teaching 40(5): 23-27. MapTimeline. (Obselete term.) See TimeRoute. TimePoint. A TimePoint is an event on a TimeLine that will be mapped onto the appropriate place along the route. The youngest TimePoint is first placed at the destination of the route, the youngest is placed at the starting point and then the remaining points are spaced out according to scale along the route plotted by Google Maps. Why use The New Scientist evolution of life timeline? As previously mentioned, the majority of the current Time Points for the default Timeline on the MapTime website have been taken from The New Scientist evolution of life website. Why? contain the real "key" events in organic evolution. have supporting literature where possible. have as much overlap as possible with the original MapTime paper. The initial plan was to pick an Evolution textbook with a nice timeline and use that. Evolution by Barton et al., for example, has nice timeline inside the front cover. The problem with this was that we could not find any credits or sources for the illustration. (It was also missing a few of the events from the original paper.) Looking at other books on our shelves lead to similar problems. We are not Deep Time experts and are not aiming to endorse certain dates or theories over others - we just want to provide a useful tool for the community. In the end, we settled on The New Scientist evolution of life website because it not only covered many of the events from the MapTime paper but it also contains links out to articles - including, in many cases, the original literature. If you visit the site, you will notice that we haven't included all of the Time Points. There are rather a lot! If your favourite one is missing, let us know. For the more recent events that are not covered by this Timeline we have, for the moment, relied on Wikipedia and Google to "crowd source" the date. We don't intend to stick exclusively with this Timeline forever, although we will keep the Time Points in the website. The planned developments for MapTime include the opportunity to add your own Time Point and Timelines. We would still like to maintain a scientifically accurate, and educationally useful, default timeline, though. We therefore welcome feedback and suggestions - not just in terms of the key events but also corrections to the accepted dates. We do ask for peer-reviewed citations for any requested additions/corrections, though. This is slightly old news now but the British Natural History Museum has launched a new Evolution iPad app, available from the iTunes App Store for £9.99 (or $13.99). It looks lovely and features a whole bunch of ways for interactively exploring evolutionary timelines. When time and development permits, we will make some custom timelines to accompany those resources. Watch this space! The MapTime website is now back up an running! Please see the post from a couple of weeks ago for instructions on how to use MapTime. As always, feedback is welcome. Now that the site is up and running again, we hope to report on some minor tweaks and updates soon. MapTime is still in development and documentation is in the process of being written around the day jobs of those involved. For the first-time user, here is a quick guide to how to use the website. This will be fleshed out into some more informative documentation in time, so please let us know which bits are particularly unclear or need more explanation. This will open up the main TimeLine page, which lists, for your information, the time points that will be plotted. Most of these come from The New Scientist evolution of life page, for reasons we will explain another time. For now, just scroll down to the map so that you can get started. To make a MapTimeline, you only really need two things: (1) an end point, usually where you currently are (or intend to give your Deep Time lecture), and (2) a start point, which should be somewhere your audience will know. At this stage, it matters not if you do not have a (2) - you can always experiment later. 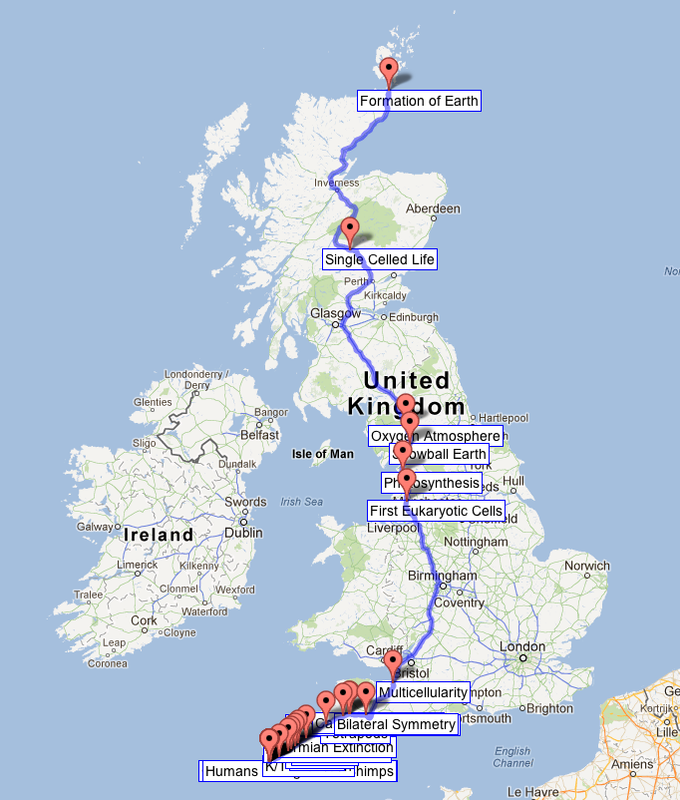 To give an example that will hopefully resonate with most people, I will create a MapTimeline that goes from John o'Groats in Scotland to Land's End in Cornwall - the furthest two points apart on the British mainland. This circle represents the minimum suggested distance for use with Deep Time, such that 40 years is 1mm and thus a human life is still visible. For different TimeLines in future, this distance will be different. As with the Destination, you can either search for your desired location (I searched for "John O Groats, Scotland") or manually place the Start point. Note: you may have to pan the map to find your Start point pin, even if you search for a location. Currently, the map stays on the Destination, so zoom and pan until you find your Start point. As with the destination, you have the option of moving the pin around until you are happy. 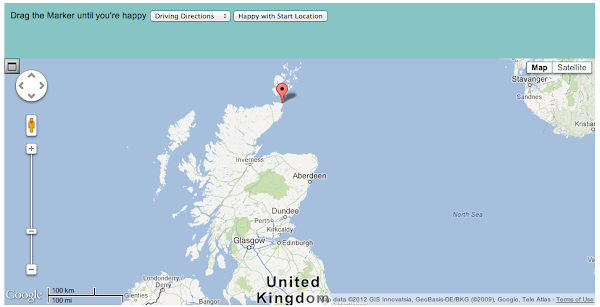 Then click "Happy with Start Location". At this stage, you also need to choose whether you want Driving Directions or Walking Directions. 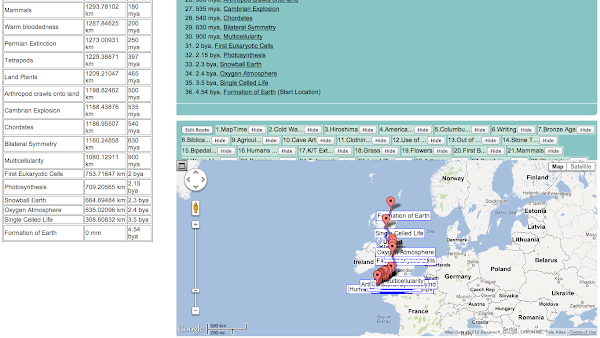 The route for your MapTimeline will now appear. 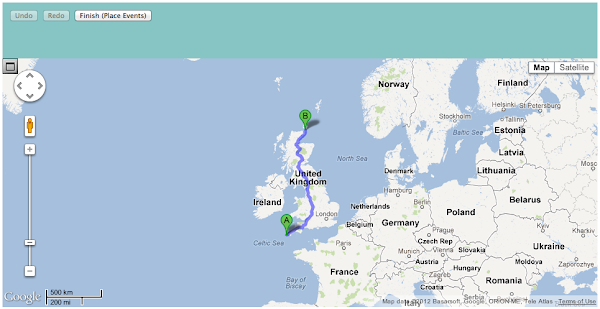 You can edit the route using the usual Google Map controls until you are happy with it. (Unfortunately, there is no "Back" function at present; if you decide that you are really unhappy, just start again. The process gets quicker with practice anyway!) Once satisfied, click "Place Events" and the real fun starts. All the TimePoints on the TimeLine will now be placed along your route at a distance proportional to time. The table on the left of the page shows the actual distances - if you want to remake the MapTimeline elsewhere, or place physical markers in your lecture theatre, this table is invaluable. (In this screenshot, the distances are from the Start but they have now been switched to be the distance from the Destination, i.e. your current location, as discussed below.) 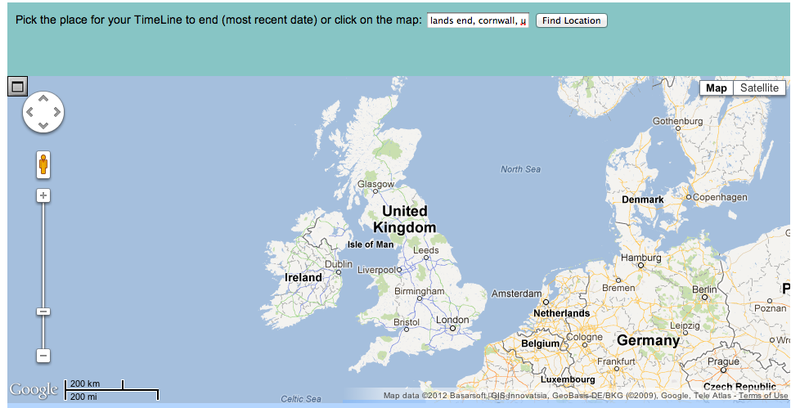 It can look a bit of a mess but you can get around this by zooming in and hiding unwanted events. Hopefully this gives enough information to start playing with the site. New features are being add quite regularly, so please do both experiment and give us feedback on the good or the bad. We will make an FAQ once we have some! An expanded explanation can be found on the "What is MapTime?" page of this blog. Please see the original paper for more on the rationale and pedagogy behind the method. 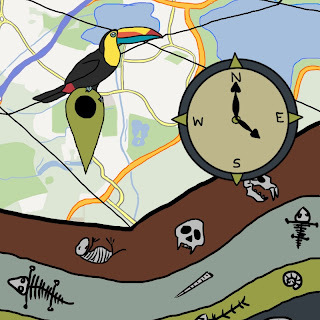 The MapTime website can be found at www.maptime.co.uk and currently features a single TimeLine of organic evolution. A brief tutorial will follow shortly. Watch this space for further developments in addition to tutorials and the like. We're also going to be on the hunt for interested parties to help test the site and develop the documentation, so please get it touch if you might be one of them. Happy MapTimeline plotting!